Have a look at the notice pictured above (click image to view it at full size). This pictures are from Danygraig cemetery in Risca. 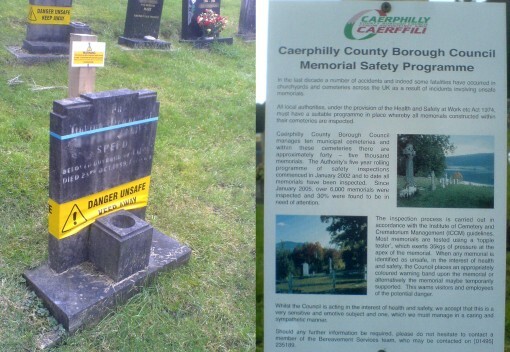 This is Caerphilly unitary authority’s approach to dealing with the issue of church headstones falling over – you can read their press statement here. Every gravestone must apparently be able to be subjected to a 35kg pressure at the top, and if not, a series of ugly measures need to be taken – from adding posts behind the stones, to flattening the stones entirely. According to the information notice there have even been some fatalities due to headstones falling over, while similar problems have been encountered in Staffordshire and Nottinghamshire. I find all of this really ludicrous. Who has possibly died from stones falling over? People messing around pushing stones over? Or employees? And is it really necessary to stick all these notices on all the graves? Surely a notice at the entrance to the cemetery would suffice. Or maybe Caerphilly and other councils could look at stabilising their gravestones in a more pleasant manner. Above all, some of the people I spoke to at Danygraig implied that it was over-zealous implementation of EU Directives that was to blame for this – seems unlikely as the board pictured mentions the Health & Safety at Work Act. Are we incapable of being sensible about risk in the UK? Surely such measures to stop graves falling over are a ludicrous over-implementation of health and safety rules? I entirely agree with your last point – the Local Authority will often go over the top, just to ensure that it is covered against any and all eventualities, with no thought for how matters will actually play out on the ground. I don’t really tend to visit too many cemeteries on other places. Plus other countries tend to do things very differently – in France a whole family has a grave that’s like a small stone house, and each body is added there. In Italy there is a similar arrangement. As for war graves: in the main the gravestones in war cemeteries are very small, and the cemeteries are very well maintained by the Commonwealth War Graves commission. So I would doubt they would encounter these problems in the first place. Overall I’m not surprised that Britain would do such silly things in its cemeteries, but this could really cause some grief if and when you saw a relative’s grave with a big yellow sticker on it! Surely you’re not actually surprised by this? The local authority will be fearful of being sued – hence taking the (arguably) overzealous approach. It’s the nature of the risk-adverse culture in which we now live. Given your interest in all things international, do you know (a) what other EU nations do about graves and (b) more seriously, what do the British War Graves authorities do to ensure that those graves are kept safe? OK, Mr Clark – I have done as you have said and looked at the HSE search – you can perform that search youself by clicking here. Well, sorry, but I think that Caerphilly council has broken that quite conclusively. It’s not really especially sensitive to apply big yellow stickers and banners to 1/4 of the gravestones in a cemetery. Further, there have been 3 fatalities in cemeteries as a result of falling stones – see this letter from the chief exec of HSE. What I would like to know is how those 3 deaths happened, and were those as a result of people behaving sensibly in cemeteries? Further, the question needs to be asked whether local councils are maintaining their cemeteries well, rather than simply rigidly applying health and safety rules. So Mar clark, I’ve done my extra research, I’ve written my extra bit, but I reckon my points still stand.